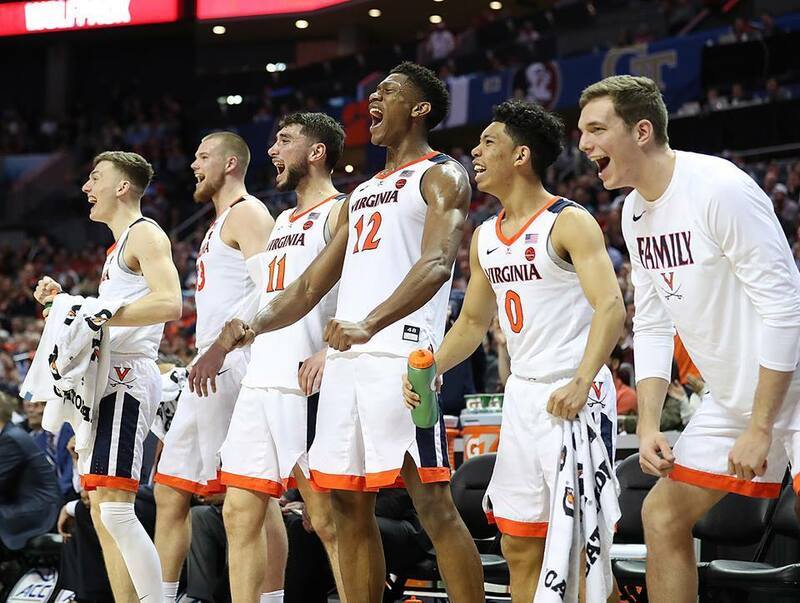 The University of Virginia men’s basketball team learned Sunday night that its outstanding season earned a top seed in the NCAA Tournament. The Cavaliers are a No. 1 seed in the South Region and will face No. 16 Gardner-Webb University on Friday at Colonial Life Arena in Columbia, South Carolina. This is the fourth time in the past six seasons that the ’Hoos earned a No. 1 seed in the tournament. Friday will mark Virginia’s seventh NCAA tournament appearance under three-time national and four-time Atlantic Coast Conference Coach of the Year Tony Bennett. The Cavaliers have compiled an all-time record of 29-22 in 22 NCAA tournaments, and advanced to the NCAA Final Four in 1981 and 1984, and the Sweet 16 and the Elite Eight several times, most recently in 2014 and 2016, respectively. 1 seed in the South Region! Coach Bennett on the importance of that. The winner of Virginia’s first-round game will meet No. 8 seed University of Mississippi (20-12) or No. 9 seed Oklahoma University (19-13) in the second round on Sunday. The team has already put together an impressive season, earning a share of the ACC regular-season title and sustaining only two regular season losses, both to Duke University, the NCAA Tournament’s No. 1 overall seed. That record earned the ’Hoos a No. 1 seed to the weekend’s ACC Tournament. They started the ACC tournament strong with a 76-56 win over North Carolina State University in Thursday’s quarterfinal round, propelled by a 29-point performance from third-year Kyle Guy and a career-high 18 points from fifth-year senior Jack Salt. However, a semifinal loss to Florida State University on Friday sent the Cavaliers home earlier than hoped. Third-year guard Ty Jerome said the team was disappointed to lose a chance to defend its 2018 ACC Tournament title, but eager to prove themselves in the upcoming NCAA Tournament. “It’s about trying to figure out how much better we can get from now to [Virginia’s first game in the NCAA tournament],” Jerome said Friday. Salt, a team captain, said he had a lot of confidence in his teammates. The NCAA provides a limited number of tickets to schools participating in the NCAA Tournament first and second rounds. As a result, ticket requests are limited to Virginia Athletics Foundation donors and Virginia men’s basketball season ticket-holders in UVA’s block at Colonial Life Arena. Ticket requests for NCAA Tournament first and second-round games were to begin online at VirginiaSports.com at 9 p.m. on Sunday. Donors eligible to request tickets should use their registered online account. Tickets may also be requested by calling the Virginia Athletics Ticket Office at 1-800-542-8821 on Monday from 9 a.m. until 2 p.m. The deadline to request tickets is Monday at 2 p.m.
Requests for the limited number of lower-level seats and available upper-level seats will be filled according to Virginia Athletics Foundation priority points order. Account holders who receive tickets will be notified by email Monday night with information about the location and hours to pick up tickets in Columbia. UVA students may request tickets for NCAA Tournament first- and second-round games in Virginia's ticket block online at UVAShots.com. The online request period will run from 9 a.m. to 2 p.m. on Monday. Student tickets will be filled from requests based on Sabre point totals. Students awarded a ticket will be notified by email. Payment will be for one ticket for both the first and second-round games. Students will only receive a ticket to the second round if Virginia wins its game in the preceding round. If Virginia does not advance to the second round, refunds for those tickets will be issued to a student’s credit card in a timely manner. Student orders will be limited to one ticket per student. Tickets outside of Virginia’s seating block at Colonial Life Arena may be available to purchase through the arena box office. Visit Colonial Life Arena box office to review ticket availability and to purchase tickets. For more information on ticket availability in Virginia's block throughout the 2019 NCAA Tournament, click here.